Jane R. Rosen-Grandon, Ph.D.("Dr. Jane") and Gary M. Grandon, Ph.D. 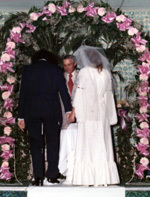 Invites readers to view marriage like a business partnership or corporation, based upon a common vision statement and rules for successful operation. This "New Marital Contract" engages couples in designing the marriage of their dreams with a tailor-made constitution and set of by-laws. Why bother to solve the same problem over and over when a mutually agreed upon solution can become part of your couples' tool-belt. Examples of brainstorming, ways of solving problems and understanding conflicts... can elevate your relationship to a new level of growth and intimacy. As a personal tool for your marriage, amendments to your constitution allow spouses to face developmental changes in the family as they arise. A Quick-read, Practical and Insightful! Secure checkout and payment processing handled by PayPal.